The Celluma PRO is quite unlike any other LED panel device available today. Our flagship product, the Celluma PRO is quite unlike any other LED panel device available today. 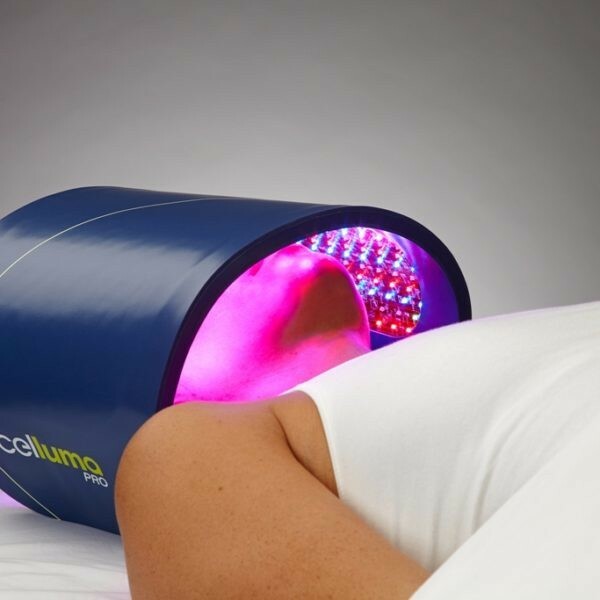 Ideally sized for over the face, the Celluma PRO can be positioned easily over any part of the body, including the spine, hip or shoulder complexes, feet, knees, and more. Our flagship product, the Celluma PRO is quite unlike any other LED panel device available today. Ideally sized for over the face, the Celluma PRO can be positioned easily over any part of the body, including the spine, hip or shoulder complexes, feet, knees, and more. Has 3 pre-programmed modes to treat acne, wrinkles and pain conditions (pictured here in the Wrinkles mode). 1 pair of protective eye goggles and 1 International Adapter Kit included. Celluma PRO measures 24â x 15â overall with a treatment area of 15â x 8â. 3 pre-programmed modes to treat acne, wrinkles and pain conditions (pictured here in the Wrinkles mode). 1 pair of protective eye goggles and 1 International Adapter Kit included. Celluma PRO measures 24â x 15â overall with a treatment area of 15â x 8â.